Natalia Goncharova is remembered for her Primitivist and Rayonist paintings, her ballet designs and her hectic life as an avant-garde artist. In 1919 Goncharova settled permanently in Paris with Larionov, and both were granted French nationality in 1938. In 1955, after living together for fifty-five years, they decided to marry. This had a beneficial and restorative effect, as their lives were slowly ebbing away due to their precarious health and paltry finances. 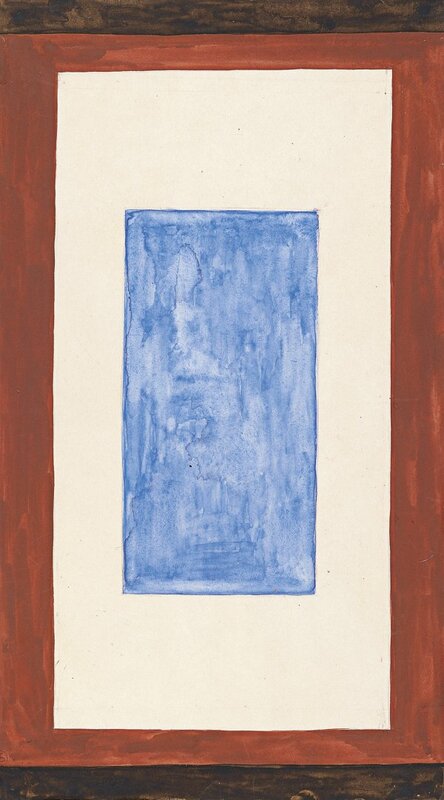 The present Composition with Blue Rectangle, more than a work in its own right, appears to be a small abstract study for a decoration or textile design. John Bowlt and Nicoletta Misler connect it with a series of cosmic paintings Goncharova made in 1957 to mark the famous launch of the first Sputnik.